A few weeks ago, armed with nothing but a carry-on bag, we left our home in Bali with the aim to travel and see as much of Sri Lanka as much as we could. Not really knowing what to expect, we landed in Colombo, which was where we began our three-week love affair with this country. 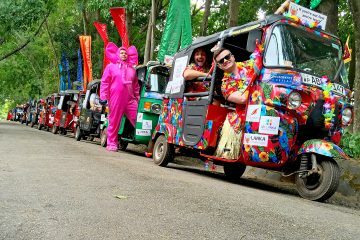 We have originally flown into Sri Lanka in order to participate in the Lanka Challenge, a crazy once in a lifetime experience of driving around Sri Lanka in a tuk-tuk. Equipped with very little knowledge of the country (#travelbloggerfail), we had a week to explore before the race started. While we had a lot to choose from, going on a safari was definitely something we knew we wanted to do. With that in mind, we started our search on the best Sri Lanka safari to go on and between their many national parks, it was no easy task. Sri Lanka National Parks: Which One to Visit? Sri Lanka is one of those countries that is incredibly blessed with a diverse landscape. Throughout our three weeks there, we saw incredible mountains, sleepy surf towns, vast hills filled with tea plantations, and most of all, an abundance of wildlife. 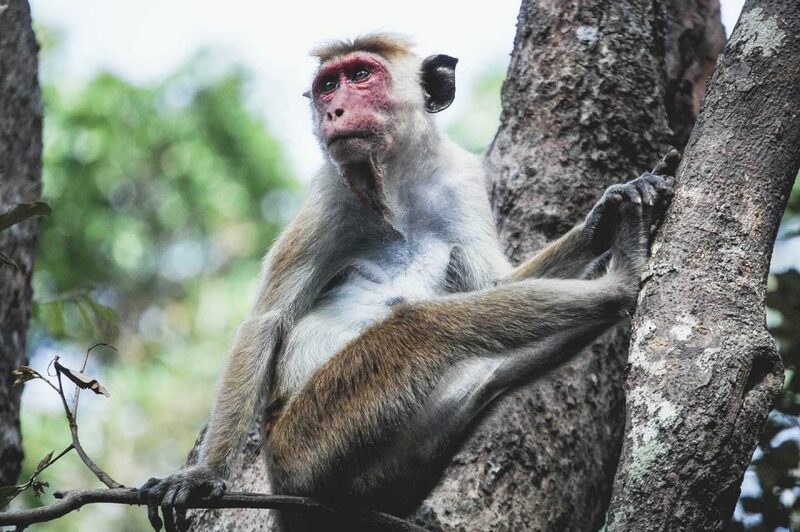 In fact, people from all over the world flock to Sri Lanka to get a glimpse of their famous elephants, leopards, and other creatures like the elusive sloth bear. Listed below are a few of the most popular national parks to visit and what they are known for. Yala National Park- Known for their leopard sightings but can also get quite busy due to the many tourists that frequent the area. 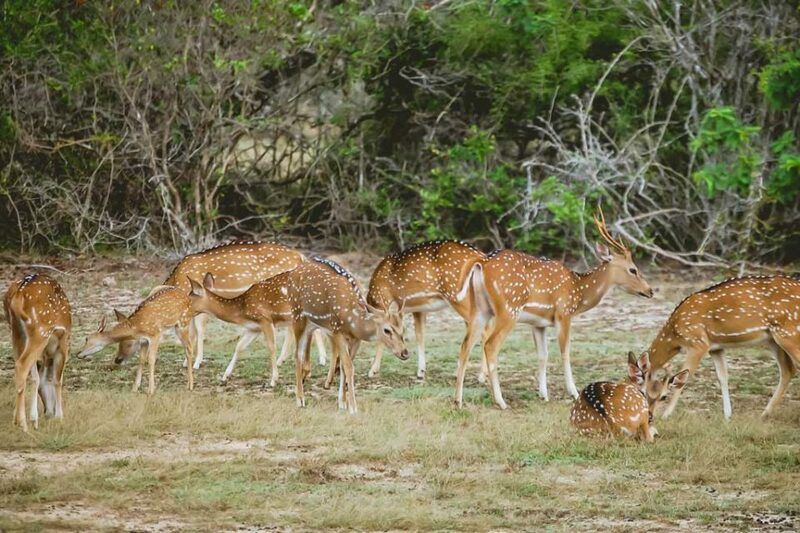 Given that we had limited time, we decided to visit Wilpattu National Park which was relatively near the other attractions that we wanted to see. 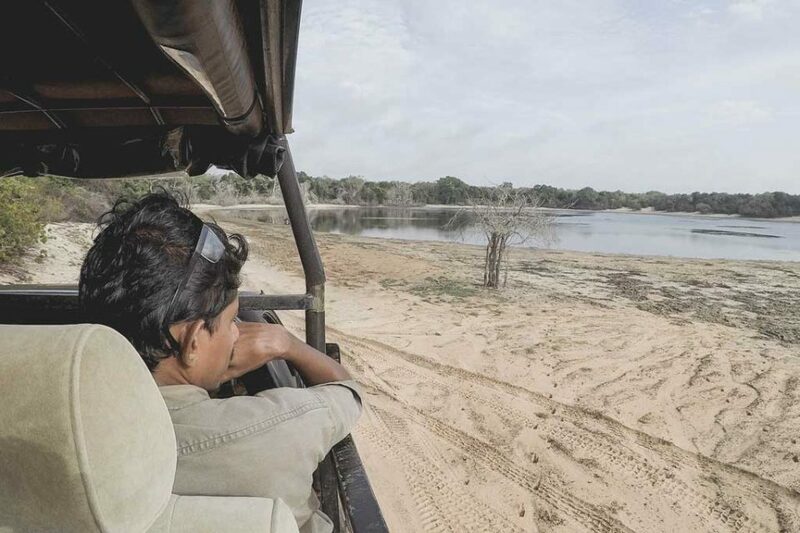 Based on a few reviews we’ve read, although the chances of seeing wildlife are less compared to other parks like Yala due to the thick forest cover, we decided to go anyways due to the intimate wildlife sighting that this National Park provides. We were torn between the almost guaranteed leopard sighting in Yala National Park (due to the large leopard population) but ultimately decided to go to Wilpattu due to the more intimate animal encounters. During our short stay, we had the chance to do two game drives, one in the evening and one very early in the morning. 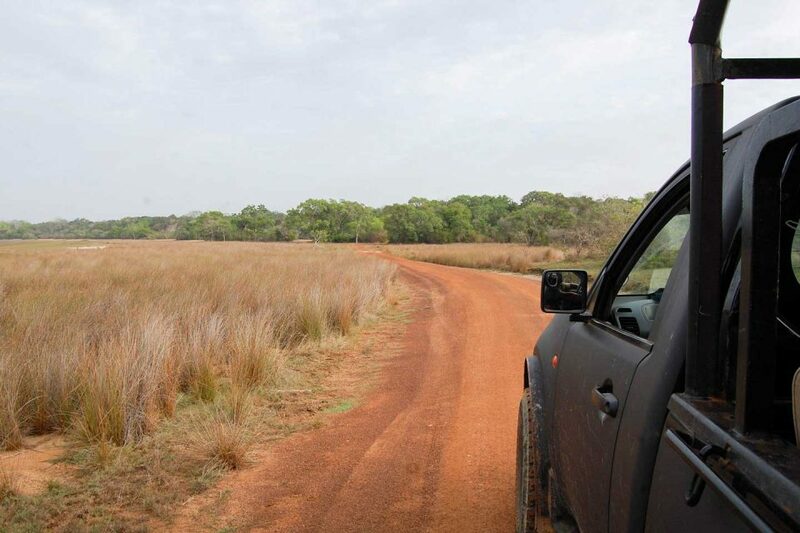 We boarded our safari vehicle (which Leopard trails rented from local providers) and began driving around the park in search of three main animals. Leopards, elephants, and sloth bears. Although the evening game drive didn’t reveal as many animals as we would have liked due to the rain, just being outdoors and chancing upon various wildlife was amazing. During the first day, we saw heaps of peacocks, mongoose, a variety of rare birds. Luckily, while we were leaving the park, we also saw a wild elephant happily munching away near the park entrance. Our early morning game drive proved to be a lot more fruitful, rewarding our early morning start. You see, a few months prior to when we arrived, there had been some new rulings regarding the park hours. After a few seasons of almost little to no rain, the park was experiencing drought. The park then had to artificially fill some watering holes in order to provide ample water for the animals. To help minimize animal distress, the park decided to limit the park hours, mandating specific hours which caused some backlog in entering and exiting the park. While most of the safari guides have different opinions about it, never the less, we had to abide. At around 5 am, we sat in our safari vehicles, ready to cue and line up for our early morning start. As most animals are active during the day, we were eager to begin our search for the elusive leopard. We drove around a large area of the park which was absolutely beautiful. Full of densely forested areas, watering holes (what Wilpattu is known for), the scenery alone made the entire experience worthwhile. After a couple of hours of driving around, our guide saw some leopard paw prints and knew that it was close. Brimming with anticipation, we desperately wanted to see one as it was already our last game drive. We took a corner and out of nowhere, we saw it. My partner Tom and I gasped in excitement and stood still, as if afraid to spook it. Walking on the road, heading straight for us was this large female leopard. It slowly walked towards us as our jeep slowly backed up to give it room to move. We had a good minute or so before it decided to make a beeline towards the dense forest and despite the quick sighting, we were ecstatic. We then spent the rest of the day driving around looking at monkeys, deer, and a variety of other birds. Sadly, we didn’t get to see the sloth bear which would have been the icing on our cake. While we have never really given much thought to safaris, our experience in Sri Lanka made us consider placing an African safari high up on our travel list. We enjoyed everything from the game drives in search of wildlife to the heart thumping moment of spotting something obscure. It is definitely, something we would be doing again soon! Naturally, we wanted the best experience possible so we started to research on good companies to use for our safari experience. 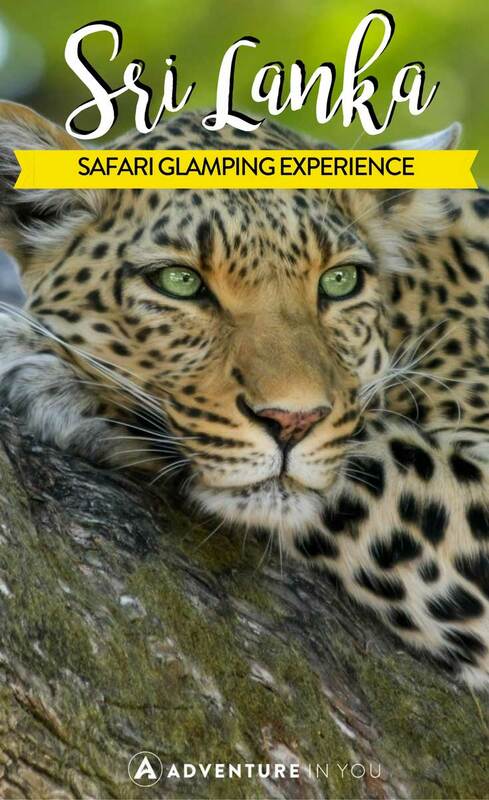 While there is no shortage of companies, we decided to go with Leopard Trails, a company who provides bespoke tented camping experience. Unlike anything we’ve ever done before, the entire glamping experience that Leopard Trails gave us was something we would truly never forget. As soon as we met up with the team, we were ushered to their campsite, located a mere 3km away from the National Park. Giving out an air of elegance, romanticism, and adventure, the campsite was decorated with a muted yet tasteful feel. Everything from our private tents down to the lounge area which had comfortable couches and a fully stocked bar gave out a whimsical feel, reminiscent of British expeditions during the 1800’s. During our time in Leopard Trails Wilpattu Campsite, we stayed in one of their air-conditioned mobile tents which was a beyond lavish. 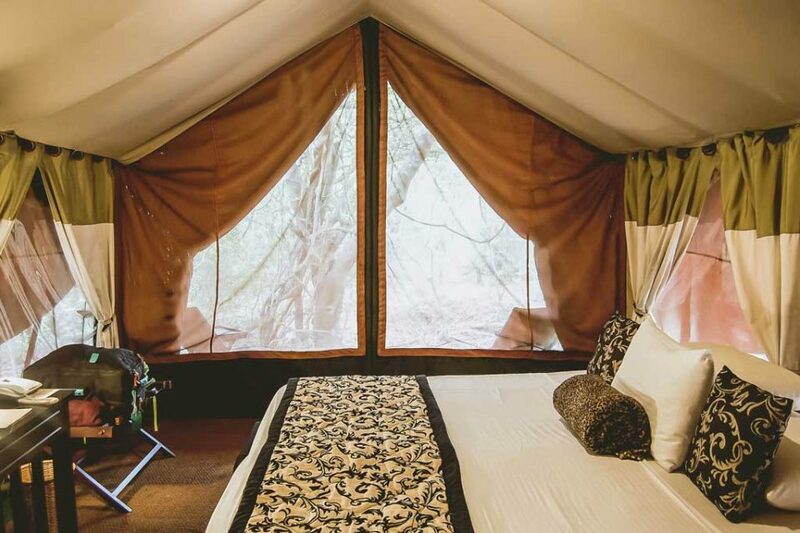 Not knowing what to expect, we entered the tent, wide-eyed and in awe of this extravagant “glamping” experience. A large bed took center stage, with the softest sheets and pillows imaginable which honestly made it hard to get up in the mornings to go for an early morning game drive. Apart from the comfortable bed, our tent also came outfitted with a toilet and an outdoor shower (which even came with hot water) which was a pleasant surprise. The luxury option consisted of a much larger tent which had a fully operational shower. Throughout our stay, we were pampered with the friendly smiles of the staff and were treated like royalty. As the experience included full board and drinks, we were treated to beautifully prepared meals, snacks, and drinks. As soon as we got back from the game drives, someone from their staff would be ready to greet us with a cold towel and some fresh king coconut juice which was the perfect way to cool down. While their campgrounds aren’t located inside the National Park itself, you were still surrounded by nature which made the entire experience even better. Our dinner consisted of a hearty plate of barbecued meat served with a few local Sri Lankan condiments and sides. Together with a few other safari guests, we ate and drank the night away as we shared stories of wildlife sightings throughout the day. After this, we took out a few chairs and gazed at the stars before retiring to our tents. Breakfast, on the other hand, was a sight to see as a feast of local produce, fresh fruit, and a mix of both Western and local delicacies was laid before us. Apart from the meals, the team at Leopard Trails also make it a point to take into consideration if you have any dietary restrictions or concerns which you don’t often find in tours around Asia. 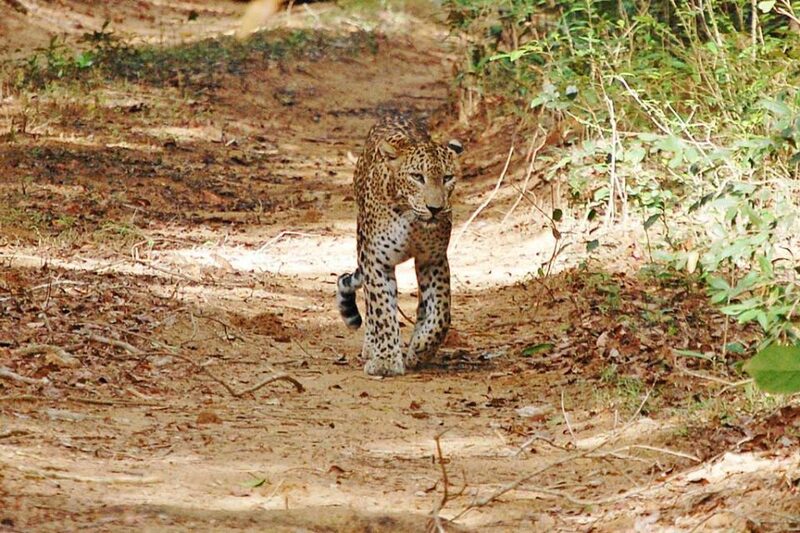 Apart from the fantastic accommodations and the food, one thing that sets Leopard Trails apart from the many other safari companies in Sri Lanka are their guides. Each of the guides are incredibly knowledgeable and passionate about their job which is very apparent when they take you around the parks. Our guide, Dhanula kept us enthralled with his little tidbits of information about Sri Lanka’s wildlife and how he constantly teaches himself by reading books. Similarly, the head ranger Arran also kept us captivated with his stories of South Africa and the private game reserve, Londolozi who the owners of Leopard Trails work with for ranger training. Being an avid traveler all over Southeast Asia, I have done numerous tours and very seldom do I encounter guides who are extremely knowledgeable about the eco-system, the wildlife, and the diverse amount of flora and fauna around them. Reminiscent of the guides that I had when I went to the Amazon Rainforest in Ecuador, our game drives were both exciting and informative rolled up into one due to the fantastic guides from Leopard Trails. Overall, we couldn’t be happier with our decision to go to Wileppatu National Park with the fabulous Leopard Trails team. 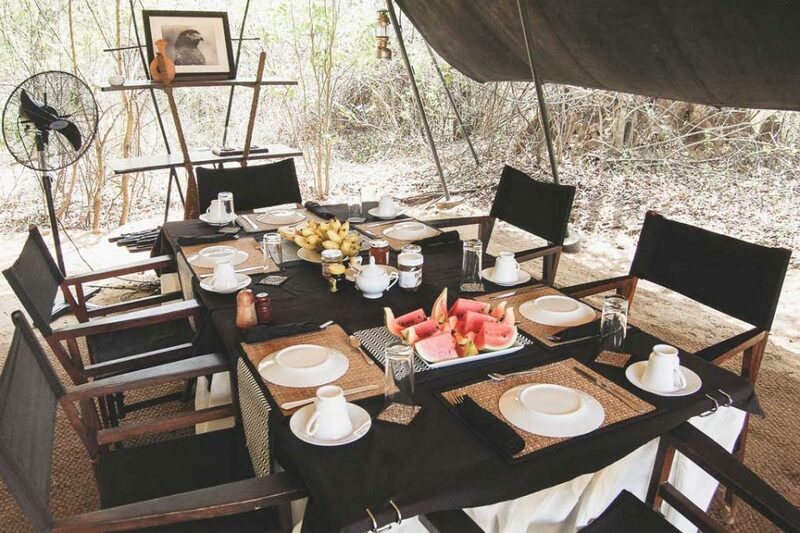 Not only did we get to experience the luxury of their glamping tents but also got to see and interact with their passionate team of guides as they expertly guided us around the national park. We set off, wishing we had one more day to spend in the park but also eager to start the Lanka Challenge tuk-tuk race which will take us 1000km around this beautiful country.